It's been a 4 years since the last time I rode the dirt roads of Putnam County so I planned a course for Will and I to follow that hit a lot of what we rode last time only from a different direction. 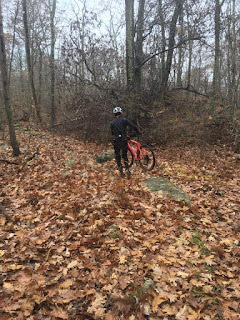 I posted the ride on the Northeast Gravel Riders Facebook group to see if anyone else was looking for a dirty ride this Saturday. There was one taker. 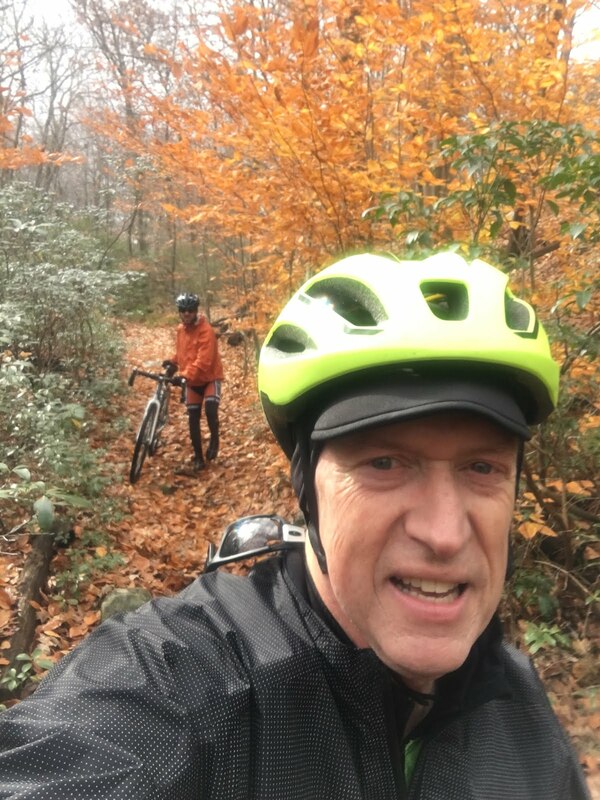 I met Will and Curt at the Clarence Fahnstock Memorial Park parking lot off of Rt 301 just west of the Taconic Parkway. This was the first time I got to see Will's new Cannondale Slate, and it was quite impressive. 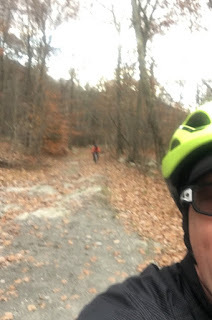 As we headed down Rt 301 to the first dirt road, Old Forge Road, it was a lot colder than I had anticipated. However, I was dressed perfectly, and figured once we started climbing it would warm up. The interesting thing about this route is that the big climbs started early on and they were huge! 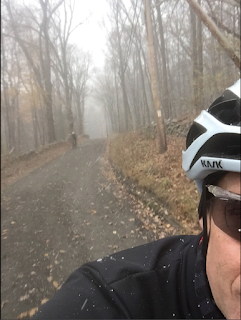 The first climb was Miller Hill and it has an average grade of 7% with a max grade of 14% but it's not quite a mile. 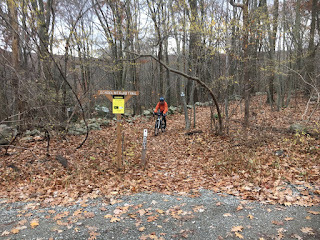 The descent on the other side is crazy steep and the only down side is right after you cross under the Taconic Parkway, the course turns abruptly west onto Hortontown Road. The next climb is Long Hill and it's aptly named. It's an average 10% grade with a max of 15%. After crossing the Appalachian Trail it actually started to flurry! And the last big climb, and the longest of the three is East Mountain Road that has an average 9% grade and a max of 13% for almost 2 miles. Then the route got interesting. 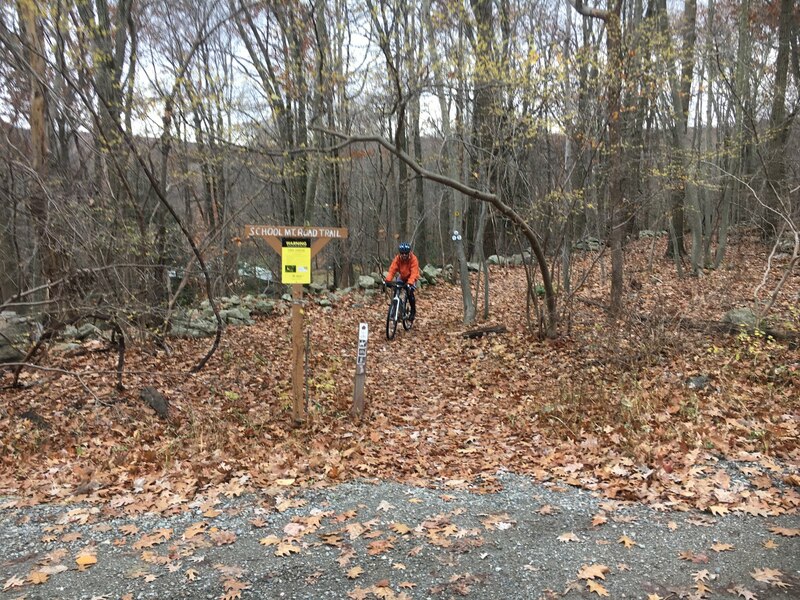 I had found the Trial map for Clarence Fahnestock Memorial Park on line and noticed that there was a multi-use trail on the west side that was open to bikes. 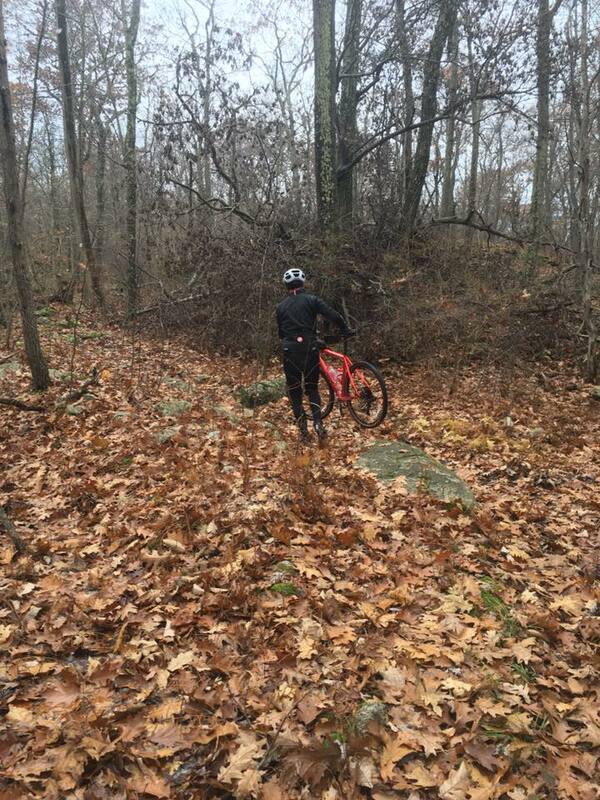 I was hoping that it was going to be an old woods road but when we rode up on it turned out to be single track. We headed down it any way because it was petty nice. There was a stream crossing that I navigated easily by walking over the stepping stones and pushing my bike through the water but the guys were having a much harder time. They started out first trying to look for alternative route. Will tried one way while Curt resigned himself to finally go the way I went. Will wasn't having much luck on the crossing point he chose and finally followed Curt across. After the stream crossing there were a few sections of the trail that were rideable but it was quickly becoming evident that this route was turning into a Napoleon's Death March. Will was carrying his bike most of the time. Since Curt had a bad ankle he wasn't enjoying this hike-a-bike either, and neither was I. We had gone a half mile and there was still another 3.5 miles of trail to go. It was clear that we had to go back. So we turned around and headed back to East Mountain Road. After crossing the stream again we were able to at least ride out with our heads held high after making a valiant attempt. Anyone looking to to try School Mountain Road (Trail) I would recommend a full suspension mountain bike. Getting back onto East Mountain Road we began the long and chilly descent down to North Highland. We headed into town and stopped at the B and L Deli to get something to eat and warm up a bit. When I asked if I could get my water bottle topped off the guy at the counter said he couldn't do that. I didn't feel a need to ask why because I could tell by the way he looked at me that he thought I didn't belong there or something. I made sure to leave a comment on their Facebook Page and update Roubaix to Brew with the same information. The next time I do this course, I am not stopping at the B and L Deli. From the Deli we headed back on Rt 9 and then veered off onto Jay Cox Road, which turned into a narrow, and winding dirt road punctuated with short but steep climbs. Along the way we passed two gravel riders coming from the other direction. When I looked on Strava Flybys they were riding a lot of what we were riding, too. Turning onto Lane Gate Road began the long climb back to Rt 9. The wind also seemed to pick up a bit, then clouds came in, the temperature dropped and it started snowing, only this time pretty hard. We came out on Rt 9 and headed south and then turned off onto Old Albany Road, which is a 6.5 mile dirt road that takes us down to the southern most section of the course. Right after the intersection with Indian Brook Road, which is a wicked fast dirt road descent, there is a formidable climb. It's a little over a mile and has an average 10% grade with a max grade nearing 13%. At the bottom of Old Albany Road we came out on a paved road called Spruce Brook that we took to a dirt road called Horton Hollow. Coming back out to pavement we continued north and turned off onto Bell Hollow, which to my disappointment appeared to have been recently paved. It wasn't a few years ago. 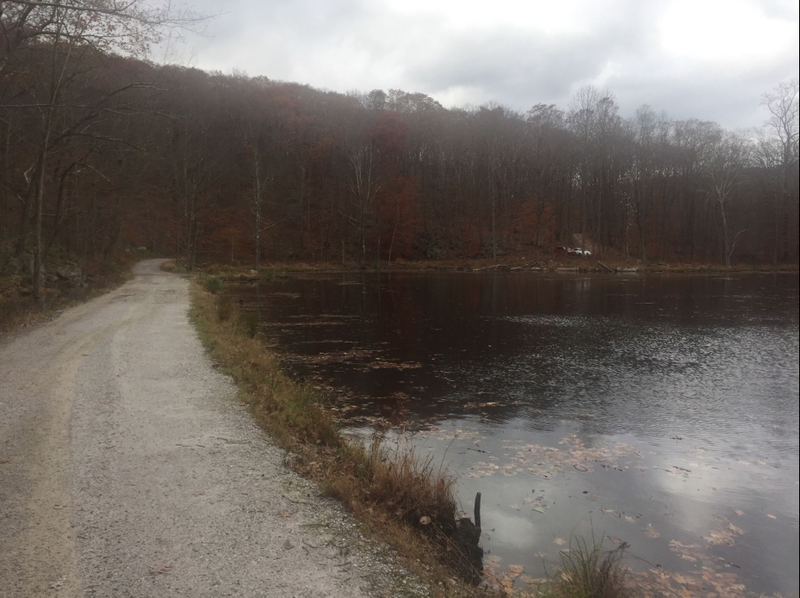 Bell Hollow turns into some rough dual track, 4x4 trail, that eventually leads to Sunken Mine Road. Some sections were more rideable than School Mountain Road (Trail) but there was still some hike-a-bike. It wasn't, however a Napoleon's Death March. Sunken Mine Road was a treat. It had some punchy climbs but the scenery was awesome, especially the pond. 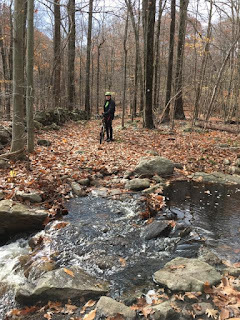 After the pond, the route was supposed to pickup the old Sunken Mine Railroad bed but we were done with trails on this ride. We headed out to Dennytown Road and then Rt 301 back to the parking area. We ended the day with a trip down to Elmsford, NY to the Captain Lawrence Brewery for some rice bowls and beer. Their Oktoberfest/Marzen Beer and the food was perfect after the ride. The brewery was packed, and there were so many kids! They even had a beer tent open. And they said that was a hilly route?